It took me 90 dresses, 3 continents and over 9 months to find my wedding dress. I figured all that time and fabric, a post is well deserved. I started my search in London and the hunt very well could have ended in London because there on one London-typical cloudy Friday afternoon, I found Yaja. Yaja, the dress of my dreams! [I said London thrice, someone misses you, London! Four times, world record]. Where were we? I got random there, pardon me. Yes, the dress of my dreams. You know that saying "You know it when you see it." It's a little deeper than that. You don't just know it, you feel your heart strings lace up with the threads of the fabric! You can't take it off, you can't stop staring at yourself in the mirror, you can't breathe, you can't really imagine the wedding without the dress. This was the case with Yaja. Yaja was a Yajaida princess wedding dress in the Pronovias Atelier 2015 collection and it sounds like every bit of its name; a long sleeve silk dress with this delicate pearl embroidery on the sleeve and a princess shaped skirt. I am not much of a fairy-tale believer but that day, for a minute i did see Princess Elsa run past my dressing room with a talking miniature snow man. By the time i found Yaja, I had tried on about 60 dresses and honestly couldn't imagine a more beautiful dress [You really have to try it on to believe it]. I had never had an experience like this with any of the other 60 dresses. 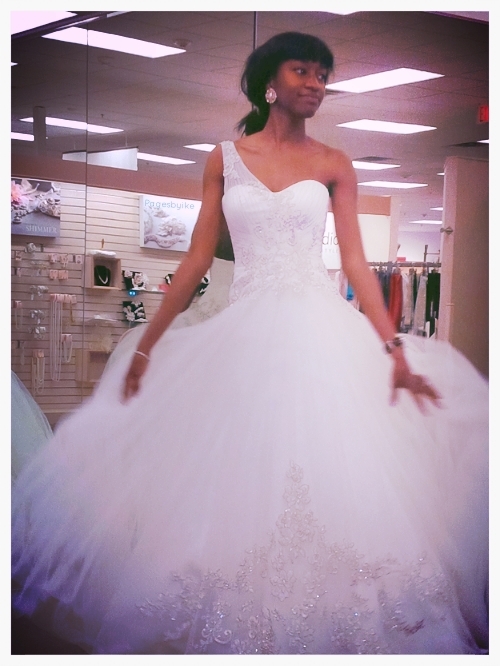 I never wanted to try on another dress! It was The One. I couldn't sleep! My general principle about shopping (and dating) is never buy (or date) anything (anyone) that doesn't get you thinking about it (him) at 2am. It (he) must be that remarkable and that's exactly what it was; remarkable. Then reality hit me! Hit me hard in the face when i saw the price tag. Thank God for that slo-mo saliva-spilling whack-on-the-face reality check of price tags! lol. Quickly, i dropped all theatrics, loosened all my heart-dress strings and jumped out of the dress. By evening, i had booked more dress-fitting appointments. Six appointments later and across the Atlantic, I found "The Other one", which proves the theory that there are two types of "The Ones", both in dress hunting and dating; The one and the The other one. At this point you realize I have to be mildly clever to interpret that. I'll give it a shot. Sometimes The One is over-rated. I think I may have had about 2 "The Ones" before Ed. Well, see how those turned out *crickets*. The great thing is, life always provides us with face-whacking reality checks that indicate the possibility of a life of inexplicable delight and contentment with another -"the other one", without ever having a feeling that you settled for less, maybe even much more! I loved my final wedding dress. I loved it in a different way from Yaja. It was more concrete, the bond we had, definitely much more affordable. Strangely, my final dress was valued at a price higher than Yaja's and I got it at about 70% off! Talk about a match made in heaven. While shopping for a dress, don't be fixated on the one you can't have, sometimes, the other one might be the keeper. Plus, if you aren't willing to spend a certain amount of money on a wedding dress, then be prepared to make dreaded C word - compromise and to move on quickly. If you think about it, you are only ever going to wear it that one time. My wedding dress now sits in my closet wondering what else the future holds for it. Not a lot , that much I can tell it; so don't shop sentimentally, saves you so much stress and money! Nevertheless, Yaja will always have a place in my heart but she is someone else's match made in heaven, just like my ex "The One's"- belonging to other people; and they'd be glad i didn't buy. This is a very small fraction of all the dresses I tried on! However, Yaja is in there! Which is your favorite dress? Shopping tip: Eat before any appointment, forget that flat-belly-for-wedding-dress-appointment gist. Well, no eba of course but just eat something because it gets really tiring!